By now you already know that we had a crazy busy weekend so far. That it was exhausting and mystical at the same time. It didn’t get less crazy when Sunday came around, although I was finally able to sleep in until 6.45! Since the day before was so incredibly crazy and exhausting, we decided to take it easy on Sunday. We had a few things on our agenda: The aquarium (admit it, you were waiting for it…), Bakerstreet (yes, Sherlock is a must-see!) and genuinely enjoying ourselves. So we left whenever we were ready on Sunday, close to 8 am(!!) and walked towards Kensington gardens. We got uber lucky on Sunday with the weather, the sun was shining so hard, we both needed sunglasses, unfortunately, since I haven’t needed my sunglasses in over a year, I can’t remember where I put them but I did know, that they were definitely not with me in London! We strolled around in Kensington gardens and finally found Peter Pan! It made my day, seeing the little boy-statue, I guess among many other books, this is one of my most favorite books, just a quick side-not. Kensington gardens is also where A got attacked by a vicious tree-branch. In A’s defense he should not have to look around for tree branches hanging around, he should just be able to walk without fearing to be attacked. The tree has been standing there for years and years and years and now I guess it had enough and grew a long tree branch that was hanging a bit low, so it basically hit A in the face. His reaction: a karate-pose that looked like he was ready to kill, at least in his head it did. To me it looked like a grown-up man who watched way too many karate-kid movies in his childhood. Once I was able to stop laughing, we got onto our tour-bus and took it all the way to the aquarium. The most magical place of all. I always find aquariums very interesting. Parents are constantly explaining to their children, which types of fish are in a specific tank, always have an answer for all the questions a child possibly could ask, whether or not the answers are accurate is a completely different story. But it was also in this aquarium, that A and I learned that sting-rays were now modernly called X-rays. A little boy kept pointing out all the X-rays to the both of us and we kept looking around for shone-through skeletons but all we ever saw were string-rays. His parents by then were already so exhausted, they did not bother to correct his mistake. We awed and ohed at every tank and this is by far way better than the Brussels aquarium, more entertaining definitely, I’m just saying. After we were done with looking at X-rays we decided to take the bus across the city and check out Sherlock Holmes’ home. We have watched all of Jeremy Brett’s and Benedict Cumberbatch’s modern performances on Sherlock Holmes and therefore there was no way we would be in London without seeing where it all originated. I do recommend though, that if and when you go, you should watch Jeremy Brett’s version of Sherlock Holmes, I think it makes the experience even more enjoyable. And then we were indecisive as of what to do next. So we sat down and thought a little bit and then A remembered that he overheard someone on one of the tour-buses saying that you could walk up the 62 meter high (fire-) monument. They build the monument in dedication of the great fire of 1666, that wiped out all the rats of London, but luckily no people were killed. This we learned from all the tapes we listened to while being on the tour-buses. Quite informative, if you ask me. So we got out at the monument and made our way to the entrance. 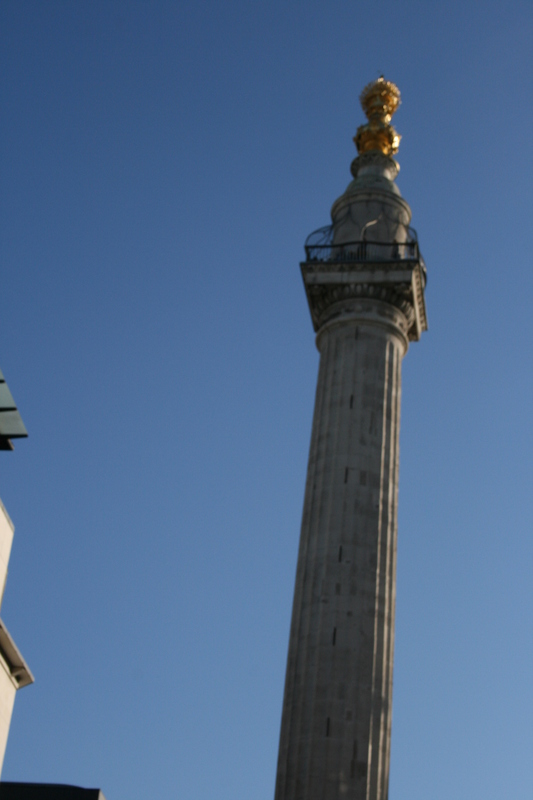 The monument itself represents a round cylinder with a golden top that looks like a fire. The walk up consists of a spiral-staircase, 311 steps up and 311 steps down. The staircase is really narrow, so when you meet someone on your way up, while they are on their way down, you have to squeeze to the wall as much as you can and let them pass. Which adds more thrill to the attraction itself, if you ask me. We eventually made it to the top and although the view was magnificent, that staircase made me dizzy, so I basically stood around a bit disorientated and waited for the dizziness to pass while A ran around on the platform and took a billion pictures. After all, he is afraid of a ferris wheel but not particularly afraid of heights, although he gets squirmy on flights (and these days he basically travels for a living). Eventually we made it back down and while A raced down, I took my time, which lead to him being down about 15 minutes before I was, but hey, I wasn’t in a hurry, I was just happy coming down without being dizzy. When we arrived downstairs we received certificates for our efforts. How awesome is that? If you always would get a certificate for exercising, I believe many more people would start walking stairs up and down. The greatest memory of the monument however wasn’t the certificate but a man I met on his way up and my way down the stairs. He was quite young, maybe in his 20ies, he was wearing a blue coat and had a genuinely smile on his face. On his back he carried a 9-year old child that had a walking impairment. My heart melted. This is what we are supposed to do in this world, help others to achieve things, they might otherwise not achieve and while carrying them on our backs, still smile, because you know you did good. Later that day, we made it back to our hotel, we stopped and got some Chinese on the way home, a couple of ales and just wanted to enjoy a nice little dinner in our hotel-room. It might or might have not also been on our account that our part of the hotel didn’t have any energy for close to 20 minutes. Apparently we had to many things running the room and ended up sitting in the dark for quite some time. But that’s what makes our dinner memorable. I had to leave early the next day to catch my flight back to Oslo, back to reality, back to work and school and exercising. A was staying a bit longer in London, he still had some work to do and came home a few days later. As I sat at my gate, reflecting on our awesome vacation I realized one thing, no matter how old you are, you are never too old to believe in fairy-tales and myths. No matter how weak you are, you are always able to carry someone else and no matter what kind of tree branch might attack you, it’s always better to be ready and strike a karate-kid-pose.